Brick pavers are constantly exposed to the elements, so they will get dirty and require cleaning. Mud, tree sap, moss, mildew, dirt and other grime will accumulate on them. To clean brick pavers, use a product that you can spray directly onto the pavers, so they will require minimal effort to clean. Spray a solution onto brick pavers to get them clean quickly. 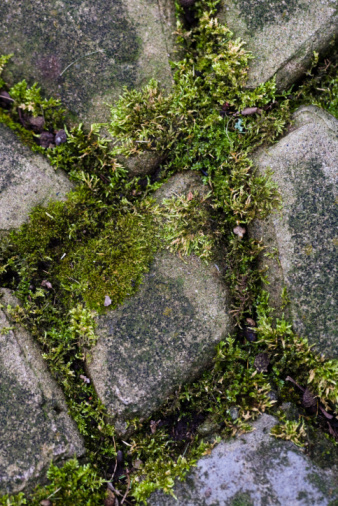 Chlorine bleach is especially effective on pavers plagued with moss, mildew or mold. Mix a solution of one part chlorine bleach and nine parts water in an empty garden sprayer. Spray it onto the pavers, let it sit for 10 minutes, then scrub with a long-handled scrub brush. Rinse the pavers well with a garden hose. Oxygen bleach cleans by releasing oxygen when the product is dissolved in water. The oxygen then tackles tough dirt and stains to free them from the surface. Oxygen bleach is nontoxic, so you don't have to worry about harming surrounding plants and landscaping. Mix the oxygen bleach and water into an empty garden sprayer, according to the container and product instructions. Mixing ratios will vary depending on the product. Spray it onto the brick pavers. Wait about 20 minutes, then scrub with a long-handled scrub brush. Once the pavers are clean, rinse with water from the garden hose. 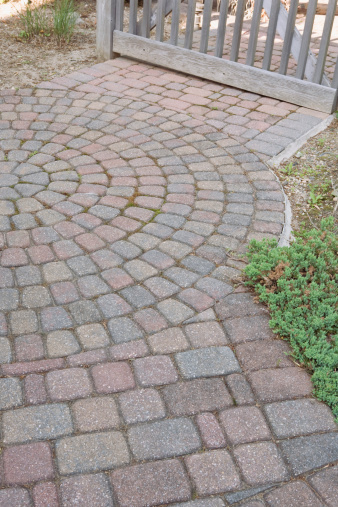 Also known as TSP, trisodium phosphate works particularly well to clean brick pavers stained with grease or tree sap. When this powdered product is dissolved in water, it creates an alkaline solution. To use TSP, mix ½ cup of powder into a clean garden sprayer with 1 gallon of hot water. Spray a liberal coating of the mixture onto the pavers. Wait about 10 minutes, then scrub the brick with a long-handled scrub brush. Rinse away the cleaning solution with water. Oxygen bleach is nontoxic, but chlorine bleach and trisodium phosphate must be handled carefully. Wear rubber gloves when using these products. Both products may damage or kill surrounding plants, grass and landscaping, so wet the plant life thoroughly with water, then cover with plastic sheeting before cleaning. Chlorine bleach will discolor surfaces and items, so wear old clothing and move anything in the vicinity that may be affected by the bleach solution. Protective eyewear is also recommended to protect against overspray from the cleaning solutions.